Peas in July! Yes, we are harvesting the last of our peas this week. When you garden in a cold climate, you may grow the same vegetables as those in warmer areas, but you don’t follow the same schedule. I thought I’d run through our pea time line to give you an idea of how it’s different here. And I just want to say that I don’t grow the vegetables around here. This is a compilation of the collective pea-growing wisdom of Purdyville. 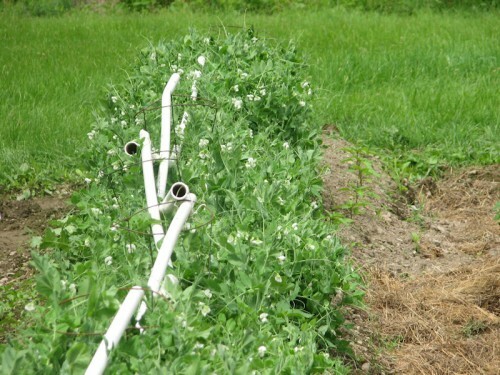 The standard advice is to plant peas as soon as the soil can be “worked,” or prepared. That means it has to be completely thawed. 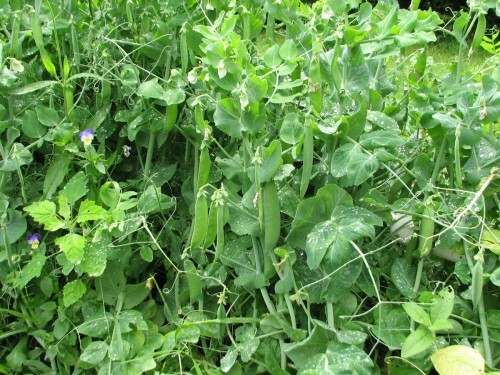 However, pea seed will rot in “prolonged cold wet weather,” according to Johnny’s seed catalog and countless other sources. And our garden has clay soil and a tendency to drain poorly, not just because of the clay soil but also because the water table is quite high in places. So both soil temperature and soil moisture have to be taken into account. It’s a delicate balance: if you sow peas too early, they may rot, and if you wait until you’re sure the soil is dry, they may run into hot weather near harvest time and produce poorly or not at all. This area of the garden is always the last to dry out, so my husband created a raised bed to grow peas. Growing peas in a raised bed is another way to protect the germinating seed from rot. The soil will also warm up faster, which is desirable in a cold climate such as ours, where the temps can drop below freezing into the first week in June. Another thing we do is soak our pea seed before planting it. However, according to Tanya Denckla, writing in The Gardener’s A-Z Guide to Growing Organic Food *, says that “recent research indicates that presoaked legume seeds absorb water too quickly, split their outer coatings and spill out essential nutrients, which encourages damping off seed rot.” So we aim to soak the seed long enough to encourage the seeds to swell, but not split. We soak them the night before, but plant first thing in the morning. After we drain the water from the soaked peas, but before we sow them, we treat them with inoculant. Inoculant is rhizobia bacteria that help the pea roots take up, or fix nitrogen, and according to Denckla, increases yields from 50% to 100%. It looks like black powder. You sprinkle it over the damp pea seed and toss to coat. 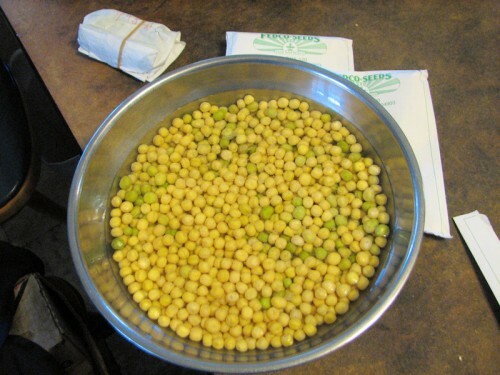 There are two kinds of shell peas, that is, the kind of pea that you take out of the pod (shell) to eat: vine and bush. Supposedly you don’t need to provide a support for bush peas, just plant two rows close together and let them support each other. What we have found is that all this means is you will have to bend over more, so we provide support for bush peas. Every year we cobble together some support for the pea plants. It varies depending on what we have on hand. After telling you there are two kinds of peas, I realize we never grow the tall vining type. Denckla says vining peas yield more and for a longer time, so why aren’t we growing them? I asked my husband, the current vegetable grower, and my daughter, the previous vegetable gardener, why this is so. My husband said he just grew whatever Talitha had ordered, and Talitha said she never saw true vining peas sold. Denckla lists ‘Alderman,’ ‘Tarahumara,’ and ‘Wando’ as vining types. I googled ‘Alderman’ and discovered it doesn’t start yielding until later than the bush types. That would mean it would be even more likely that we’d hit a heat wave before they were done producing. I do remember we grew ‘Wando’ sometime in the past, and perhaps we found that we didn’t get many before they turned bitter in the heat. Here's a closeup of this year's pea support, brought to you by tomato cages and plastic pipe. Peas were in full flower by June 16th, two months after they were sown. It is a good idea to grow more than one variety, whether you grow bush or vine, because one variety’s ideal weather could be another’s nemesis, or a certain variety may be more chewed up by insects. In other words, diversity protects you from catastrophe. Plants with pods at different stages of maturity on July 2nd, 78 days after seeds were sown. By July 5th, our pea harvest was at its peak. Peas taste best raw when they are slightly immature. For eating raw, these peas are past their prime. 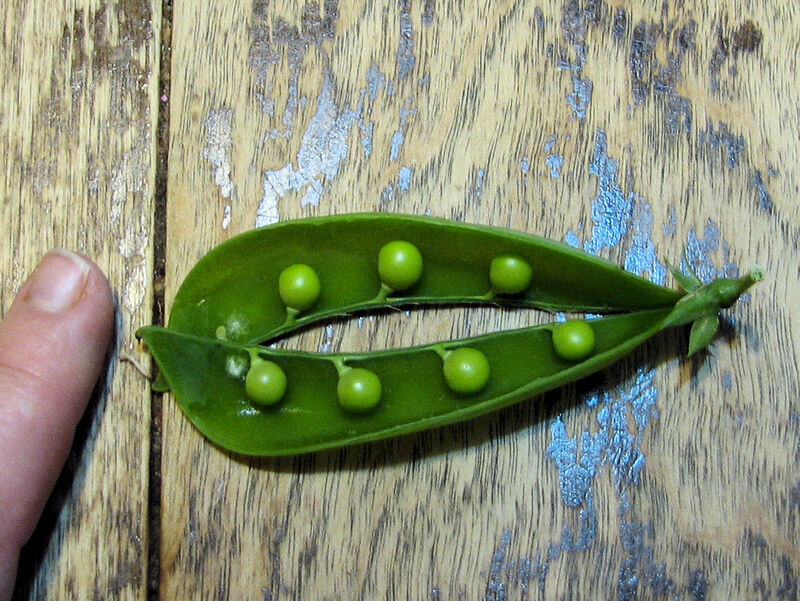 That’s how they look in every picture you’ll ever see of peas in a pod, but they taste starchy–or even bitter–if you eat them raw that way. I don’t know how they taste cooked. We’ve never cooked our homegrown peas, or frozen them for later eating. We eat them all as snacks, raw. 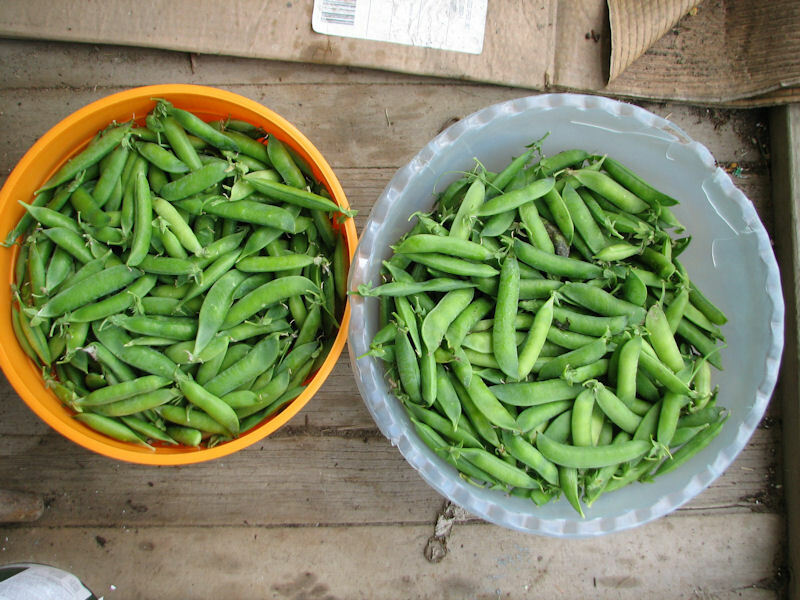 If the pods look pale green, they are really overmature, but you should pick them anyway. If you don’t, it will signal to the plant that it’s job is done, and it doesn’t need to make anymore flowers or pods. Eventually the heat will do that, but you don’t want it to happen any sooner than it has to. Because, you want to be eating peas in July! *We actually have The Organic Gardener’s Home Reference: A Plant-By-Plant Guide to Growing Fresh, Healthy Food , which is the previous edition of this book. Johnny’s Seeds has good seed starting and growing information for all their seeds. You have to click on a particular variety to see it, under the tab Growing Information. Fedco Seeds has a chart summarizing the most pertinent seed starting and growing information. Some Vegetables Balk at Cool Nights. 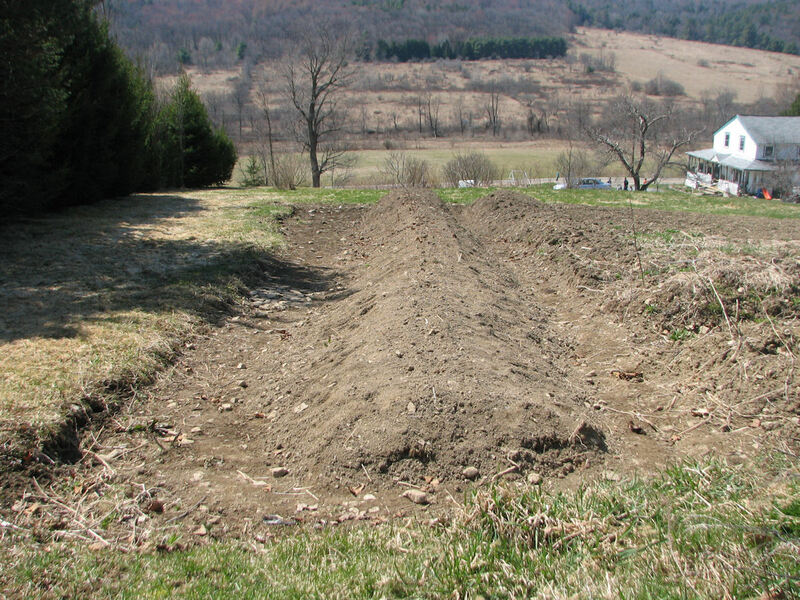 We were just able to get a couple of community garden plots. Therefore, I’m doing everything as a “second sowing”, including peas. It has been years since we’ve had access to an allotment for veggies, so this will be an experiment. The ones we’re trying are called ‘Laxton’s Progress’ which I assume from the package are a vining sort. Wish us luck. .-= Helen at Toronto Gardens´s last blog ..To tchotschke or not to tchotchke =-. Because the timing is a bit tricky and we usually have only a 2-week spring in Minnesota before going from frosts to 90 and muggy, I gave up on peas. Of course, this year the weather has been cool and it’s been a great year for peas. Ah, well. .-= Mary S.´s last blog ..Bee Magnet =-. I’m near the end of my sugar snap pea season. But my neighbor says she always does a second crop. I have some seeds left so I am going to give it a try. Also thanks for the reminder about time to dig colchicums. I forget every year. My clump is overcrowded and now in a spot where I can’t even enjoy them. The only problem is getting in to that crowded spot. I’m going to try, though. 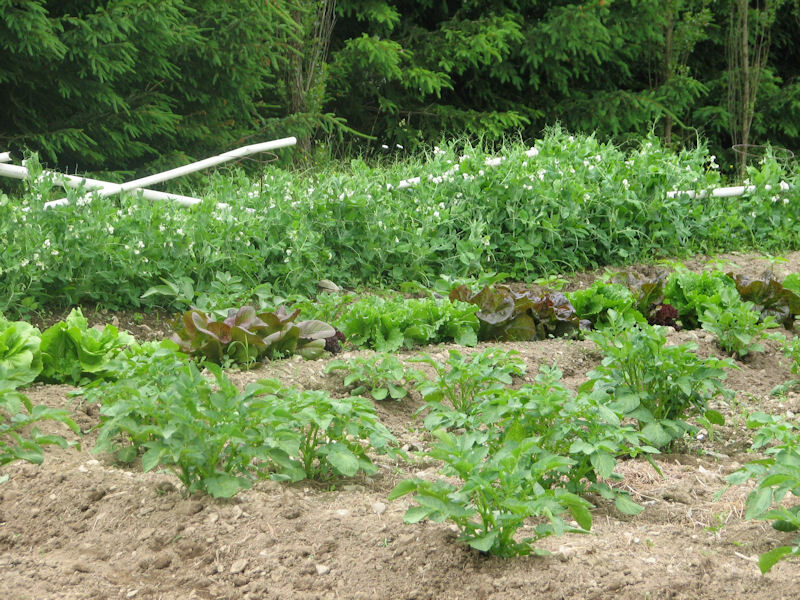 .-= commonweeder´s last blog ..The Most Important Crop =-. Pea season is long gone here. I have a friend who grows them with great success but I’ve never tried. Finding a spot for them is the problem. .-= Cindy, MCOK´s last blog ..Through the Garden Gate: Monday, July 6th =-. In 5b in Ct I just harvested the last of my snap peas – the only kind that I grow- the tall vining ones mostly for space reasons. Have you ever done a fall crop? Thanks very much for the pea tutorial. I especially appreciated the peeper alert. That’s so easy to remember because of onomatopoeia. I just pulled my plants up at the end of last week down in Zone 5b. Great post! I’ve never grown peas because I just assumed that they wouldn’t start bearing until it got too hot, but I was basing my conclusion on the vining type. Maybe I could grow the bush types. I’ll make note of planting peas when I hear the spring peepers. That makes more sense than just planting on an arbitrary date. .-= Mr. McGregor’s Daughter´s last blog ..Weird Oakleaf Hydrangea Flowers =-. Wow, it really is cool in your neck of the woods to have peas this late. I’ll have to go back and check but I think most of mine were done about four weeks ago. I pick them for cooking and swear by the variety ‘Green Arrow’. 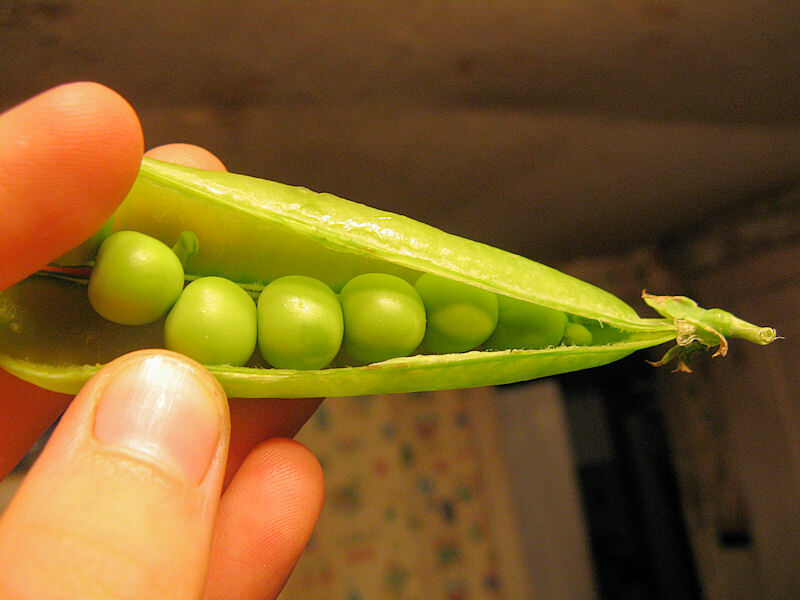 It has lots of peas in a pod! .-= Carol, May Dreams Gardens´s last blog ..Letters to Gardening Friends, July 12, 2009 =-.